The nose is very light and subtle, delivering mint leaves and thyme, and a hint of fresh cut grass. 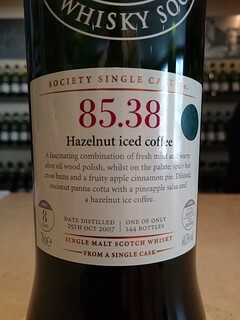 The mouthfeel is decent, but has no cling - this dram slides over the tongue! The body is quiet, with honeycomb and coconut joined by pineapple juice. The finish is short and vanilla sweet. Water brings out thin, rapidly expanding whorling that settles into short-lived mottling. The nose now gains rosewater and pineapple juice, with hints of coconut and a quiet reminder of the prior herbal nose. The body has more pineapple and coconut, less honeycomb. The finish is sweeter, with more of the pineapple juice and a hint of thyme. This dram really needs water (or time) to impress. A lovely dram for breakfast.